Lost & Rare, Vol. 1: Lost TV Pilots is a collection of very rare TV Shows from the 1950s and ‘60s starring some of that era’s popular personalities like Jane Powell, Margaret O’Brien, Frank Lovejoy and Ed Wynn. A pilot is a sample episode shown to a potential sponsor or aired on a network to test audience response… and that’s what ‘Lost & Rare TV Pilots’ is all about. Television rarities abound on Lost & Rare, Vol. 1: Lost TV Pilots, a fascinating collection that consists of five pilot episodes: three TV shows that were never broadcast over the airways and two programs that did run on television for short stints. Lost & Rare, Vol. 1: Lost TV Pilots has been compiled and produced by Festival Films for home video enthusiasts and Movies Unlimited is proud to release this collection on DVD, with more than two hours of family entertainment, available now for $19.99. “The Jane Powell Show” (1961): MGM musical/comedy star Jane Powell goes the TV route play­ing an entertainer who tries to adapt to life in a small college town with math professor hubby Russell Johnson (The Professor on “Gilligan’s Island”). “Munroe” (1963): The title character is a lovable K-9 Corp mutt who gets into trouble with a lion and a cat in this potential sitcom with Sig Ruman, Guy Marks and Joan Freeman. The episode even has a pitch for a sponsor from its cast members! “Maggie” (1960): Filmed in 1958 but aired in 1960 on a CBS summer series called “The Comedy Spot,” this George Burns-produced comedy centers on married actors Leon Ames and Fay Baker who move to Connecticut with teenage daughter Margaret O’Brien and soon clash with their new neighbors. “Meet McGraw” (1954): Frank Lovejoy is the title character, a tough guy private detective hired to protect beautiful Audrey Totter. This installment of “Four Star Playhouse” introduced McGraw, who later appears in an episode of “Stage 7” and his own series in 1957-1958 called “Meet Mc­Graw” (and, later, “The Adventures of McGraw”). Lost & Rare, Vol. 1: Lost TV Pilots has been released by Festival Films, in conjunction with Movies Unlimited. Movies Unlimited is one of the oldest and most reliable video retailer sin the world, specializing in DVD and Blu-ray titles. Lost & Rare, Vol. 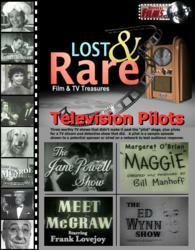 1: Lost TV Pilots can be ordered through their website at http://www.moviesunlimited.com or by calling 1-800-4-MOVIES. The Philadelphia-based company also publishes the annual 800-page encyclopedic Movies Unlim­ited DVD Catalog.